It can be too much hassle carrying out a bulky and heavy vacuum to clean your car interior. Instead, it’s more convenient getting a handheld vacuum more suited, and in some cases specifically designed for car use. You may also find helpful our comparison chart for the best handheld vacuum for cars. Here are 5 of the best handheld vacuums for cars, based on their usability and suitability for doing a good cleaning job in a vehicle. Here’s a good little cordless DustBuster that is perfect for vacuuming cars and doing small pickups around your home. Having a built-in 14.4V motor which provides very good power relative to its size. 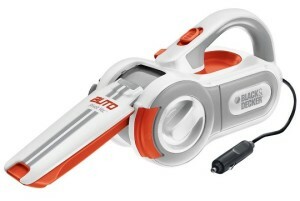 The great thing about the Black & Decker CWV1408 DustBuster (read full review here) is its ability to clean both wet and dry waste. As an added bonus, it also comes with a wall mountable charging station for that added convenience. 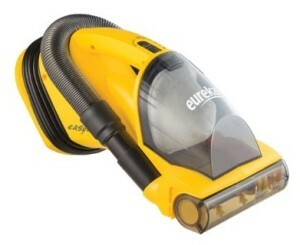 The Eureka EasyClean 71B (read full review here) is not only one of the best car care vacuums, but it’s also one of the bestselling home use handheld vacuums too, simply because of its multiple use and effectiveness in cleaning, thanks to its innovative revolving brush. Many users are actually surprised by its power, but this is not much of a surprise when you find out that it has two motors integrated – One for the revolving brush, and the other for the suction. Although it doesn’t have a car charger, it has a 20-foot long cord that plugs into an AC socket, another reason for its power. The crevice tool and stretch hose will certainly be of good use when cleaning your car also. All of these features plus a reasonable price have easily made the Eureka EasyClean 71B a fan favorite. It may not be the smallest, but the Carrand 94005AS Auto-Vac (read full review here) doesn’t fall short when it comes to car care performance. 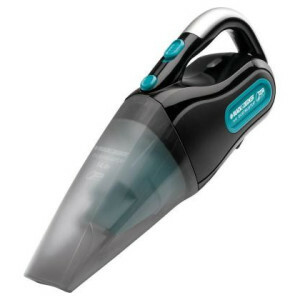 With 550 watts of cleaning power, it makes it one of the most powerful handheld vacuums. What makes this device so highly-rated by its users? 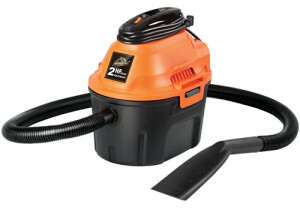 The suction power and handy tools to clean almost anything, from ground-in dirt to pet hairs. It’s a well thought out design that has storage at the rear end for the included dash, crevice, carpet and console tools. The 40” flexible vacuum hose which is attached to a 360 degree turning elbow and wraps around the body, enables you to access all the narrow areas in a car. Based on how impressed users are of the Carrand 94005AS Auto-Vac, we can comfortable say that it’s pound-4-pound one of the best, if not the best handheld vacuums for car care. The convenience, versatility and power of the DEWALT DCV581H wet and dry vacuum has made it a bestseller for people who want something lightweight and portable without compromising on power. Although slightly bigger and coming with a higher price tag than most other car vacs, it also offers more. This DEWALT DCV581H can be powered by an AC outlet with a 6 ft. power cable, or can run cordlessly on 18V or 20V (max) battery. This makes it ideal if you’re going to transport the unit around. The noise level is low also, so no need to worry about causing a disturbance. Attached to the unit is a sturdy crush-resistant 5 ft. nose that tidily wraps around the back of the unit. A wide nozzle and crevice tool are also supplied and can be stored on board. All of these attributes provide great performance in cleaning up mess, no matter if it’s wet or dry. 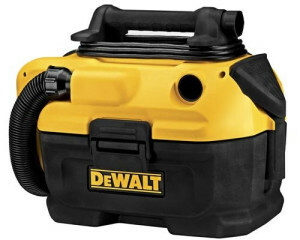 DEWALT are known for their high quality power tools, and this handheld vacuum is no exception. Nothing less than a thorough car cleaning experience is expected from the ArmorAll AA255. 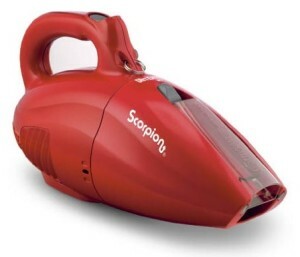 It has a very powerful 2HP motor that provides plenty of suction for picking up dirt and debris (has an impressive storage capacity of 2.5 gallons), and blowing for removing dirt or drying surfaces. A long 6 ft. hose helps you to easily reach around all areas of the car without having to carry the base unit around, while the host of accessories (which can be conveniently stored on board) aid you in cleaning even the most awkward of areas. The 10 ft. power cord is more than adequate enough to reach a far distance with the unit, and it can also be wrapped around the large handle to save space. There’s even a safety auto shutoff mechanism that activates when the storage limit is filled to prevent overflow. 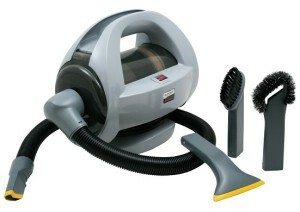 The ArmorAll AA255 is truly one of the, if not the best value portable car vacuums around. 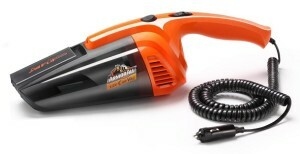 You may also find our Best Handheld Vacuums For Cars Comparison Chart helpful. The below models are handheld car vacs that was on our list but was pushed out to make way for newer and better products. However, that doesn’t mean that they’re not good so you may still want to check them out. Compact, lightweight and useful are words that best describe the ArmorAll Wet/Dry Handheld Vacuum. It’s ability to pick up both wet and dry debris has make it a popular choice for car cleaning, add to the fact that it’s also powered by a 15 foot cord that plugs into the cigarette lighter, which is better convenience. Other notable features are its built-in crevice tool which slides out from the head, an LED torch which is handy for night use and to see into dark corners and cracks, a brush and a squeegee tool. Many users of the ArmorAll Wet / Dry Handheld Vacuum finds it easy to use, and great for quick pick-ups of dirt and debris around the vehicle. For the price, it’s definitely one of the best value handheld vacuums for car care. While it isn’t specifically designed for car use, users have found the Dirt Devil Scorpion (read full review here) highly compatible in that area. This is owed to its lightweight and compact design, 16 foot long power cord and its highly convenient Quick Flip crevice tool. It runs on a 7 amp motor, which users have found to be surprisingly powerful for such a small device. Since it’s corded, there is battery time limit and suction power remains consistent throughout. For its low price, you feel that you’re getting more than your money’s worth, especially since it also comes with a 3 year limited warranty. 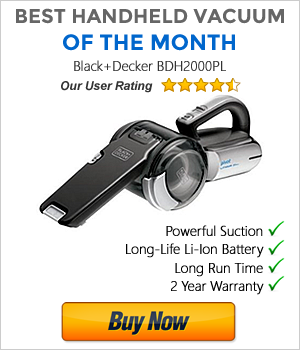 Black & Decker have several handheld vacuums for car use, but the B&D PAV1200W 12V Cyclonic-Action is what we consider, their best one, and one of their most popular bestsellers also. It features a pivoting nozzle (which has a built-in crevice tool at the tip), a design feature seen in a few of their other handheld vacuums, which allows you to access hard to reach places in your car. Its Cyclonic Action technology ensures that the filter stays clean while the power remains strong. It comes with attachments you will find useful when cleaning your car, including a brush tool, right-angled brush, and a hose. It’s powered by a 16-foot cord which plugs directly into the cigarette lighter input. Most users find the cord long enough to reach around their entire vehicle, and powerful enough to do a good cleaning job.